When David was little, he watched Man with the Golden Gun. James Bond chasing the bad guys in a speedboat, racing through islands of rock. 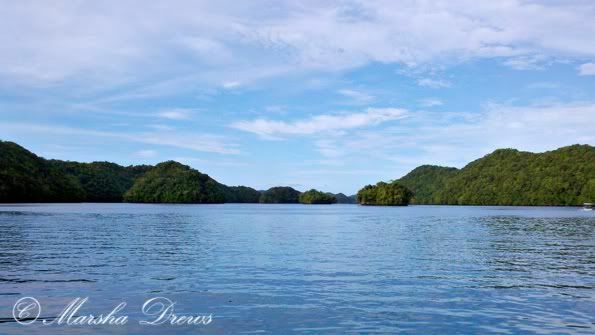 He sat through the credits to see where this spectacular place might be-- Palau! 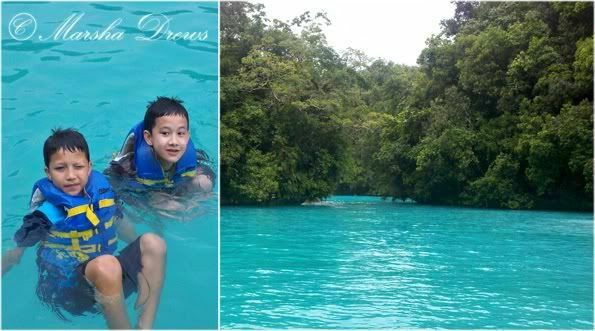 David fulfilled his childhood dream of visiting these emerald islands and crystal clear water. And we got to go too! Eeeeeeeeee!!! The water was inky with deep blues and bright turquoise, yet clear to the bottom. I can't even explain how that is possible. Can you see why they call them the Rock Islands? Our first stop was a cove that the locals call the Milky Way. We couldn't snorkel here as the water was too cloudy blue to see. David dove down to the bottom and brought up a handful of white limestone mud to smear over our face and body. (Kicking myself for not having a picture of my mud smeared boys!). The mud is supposed to be very good for your skin and is even sold in spas. It was bluer than the fake blue of a swimming pool! 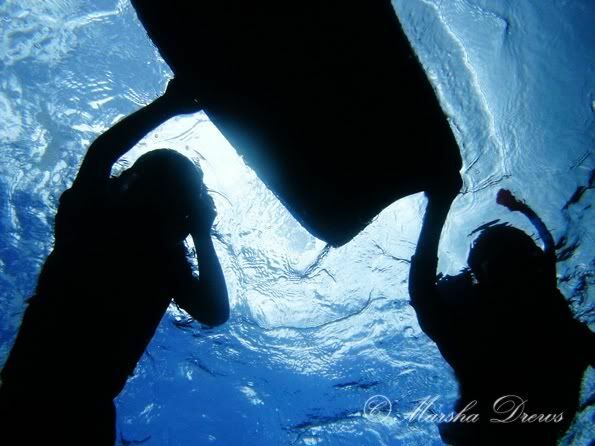 The Big Drop-off on the southern corner of Palau was our next stop. 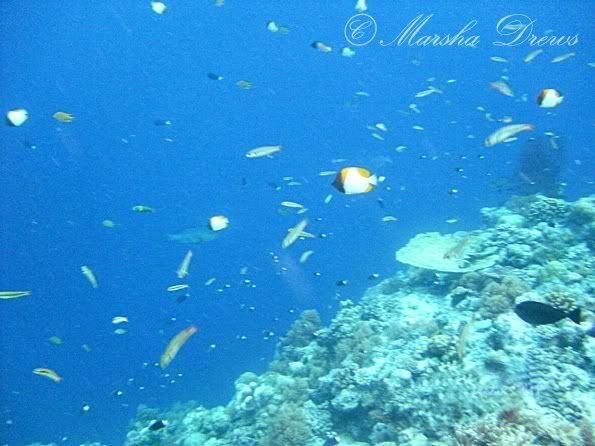 This vertical reef wall is popular for both snorkeling and diving. We opted to snorkel. :) I am so proud of my boys! They weren't scared a bit! 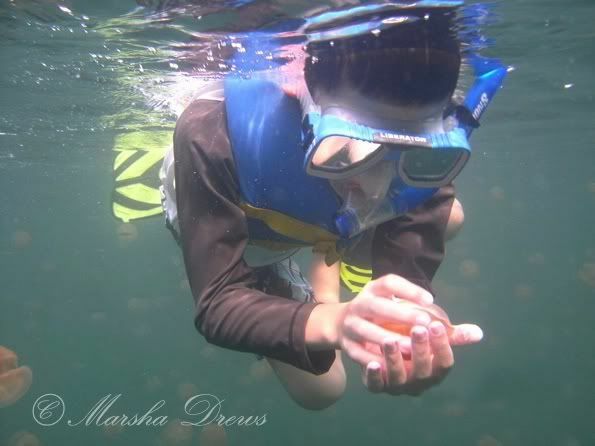 The Big Drop-off is as close to diving as you can get with its bright coral and colorful fish. The pictures just don't do it justice! 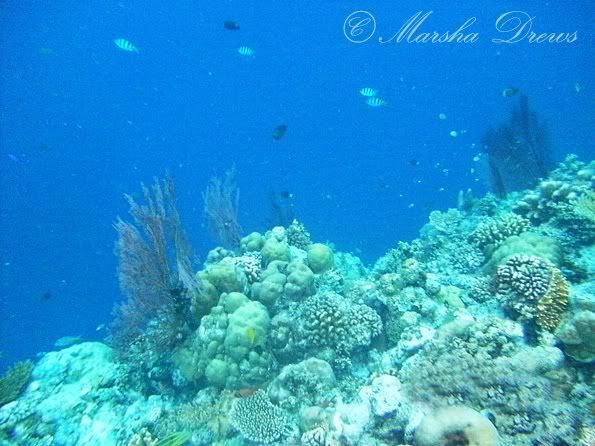 Picture the gray coral down there as vibrant yellow and red. The water over the top of the wall ranges from 10-20 feet deep. But the side of the wall? The water turns midnight as the depth of the floor drops 1000 feet! 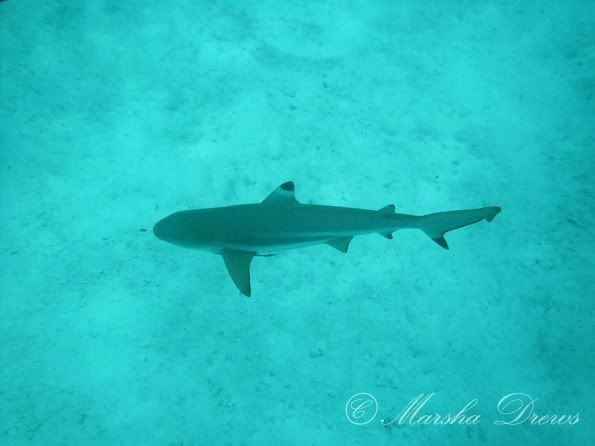 We had lunch and then swam a short distance from shore to snorkel with black tipped SHARKS! These guys look far away, but they were literally right below us! The only advice our guide gave us was to not reach our hands out to the sharks. Uhhh... okaaaay, I guess I can resist that urge. We still can't decide what was the most exciting adventure in Palau. Was it the brilliant colors of the Big Drop-off? OR swimming with these guys? 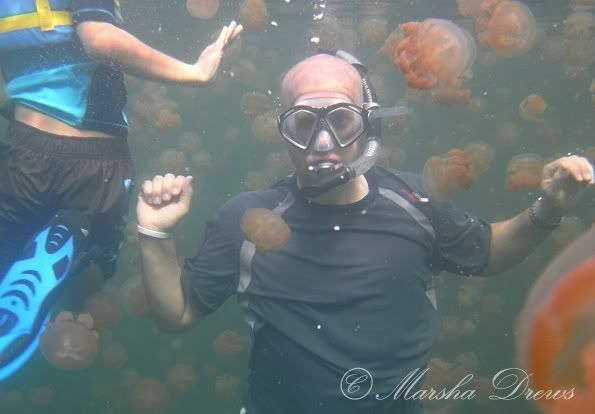 Oh man, Jellyfish Lake was SO COOL! Don't worry, these guys don't sting! They follow the sun through the lake, constantly brushing up against you. The boys showed NO FEAR. Me? It made me jump as if a big roach had run across my hand! 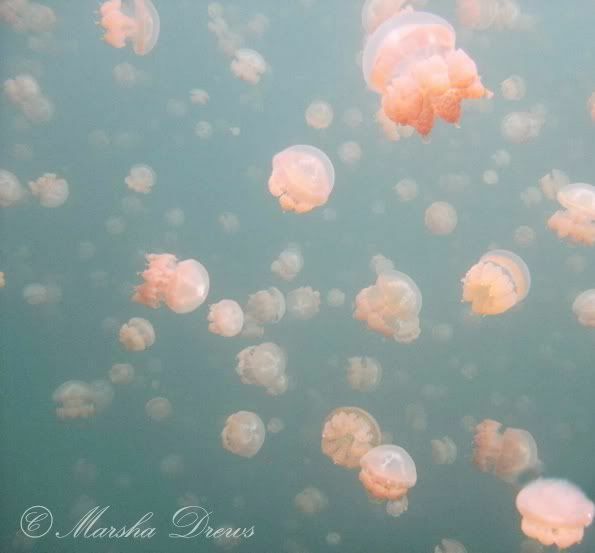 But when the water is that thick with jellyfish, you just can't avoid it. 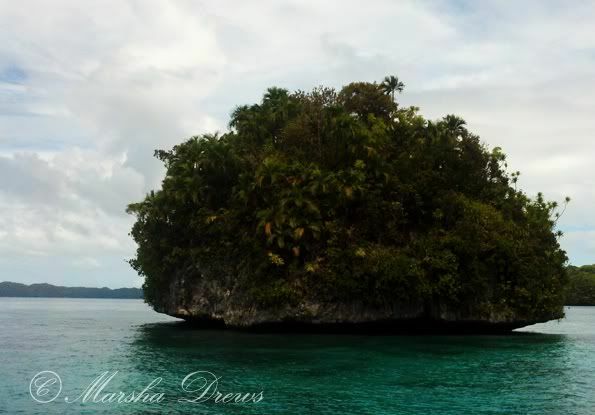 Even in the rain, Palau was the most beautiful place I have ever been. I kept thinking WOW, when God created the piney woods of East Texas, He also made this place! His understanding and ways are so much greater than my ways. And His creativity and imagination render me speechless. It sounds so cliche but words and pictures could never do justice the breathtaking splendor of Palau. What a gift and blessing to behold it with my own eyes, to etch the landscape into my memory! Those are some amazing pictures! I look forward to the day when we can travel and see some places like that. I am glad that you are guys are having such a good time there. Though the jellyfish pics made me a little nervous. :-) Boys without fear...yup, I have one of those. From someone who has lived in the Midwest her whole life - I can't even imagine color like that! That's amazing! So glad you're having a wonderful time!! So glad y'all are having these awesome experiences! 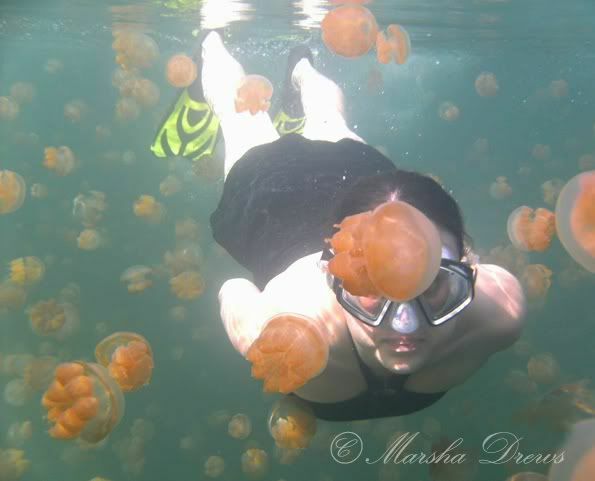 I think the jellyfish would have given me the creeps BIGtime! I WENT THERE, TOO!!! I saw the title to your post and just about jumped out of my chair, lol. We have very dear friends that are missionaries to Palau, and my dh and I went to visit them. We experienced many of the same things there that you did. I kept reading thinking, I wonder if they went to Jellyfish Lake. YAY! That is a sight/experience NOT to be missed. I'm with you...they feel like jello. SO cool! We would love to go back someday and take our kids. It is truly a magnificent place that speaks of God's creation. Thank you so much for sharing!! You brought back many wonderful memories to my mind. God is good! Those colors were amazing. The jellyfish swimming looked like it'd be my favorite. I mean, when do you get to do that?? Holy cow... David's got a jellyfish on his head!... oh never mind... that's just his head! Love ya, sis! WOW!!!! I would so swim in those! What an awesome experience. Oh Marsha, I have tears in my eyes looking at these photos and this experience. What a true Gift from God. Such an amazingly beautiful place. Beautiful doesn't even quite do it justice. I love the pictures. What a blessed thing to behold. Those are great pictures! It looks like Nemo in real life! lol I love those! It looks like a great vacation. BEAUTIFUL! WOW! So glad you got to experience that and that you took pictures so we could share a little. :) I love you! Wow! So gorgeous! What an incredible, memory-making trip for your family. Thanks for sharing it with us! How beautiful Marsha! I am living through you girl! Thanks for sharing! Incredible! I am so jealous (I want to go!!!) But also so happy that y'all got to experience that. What a fun adventure! I'm also very impressed with you for getting all up in the jellyfish's business. 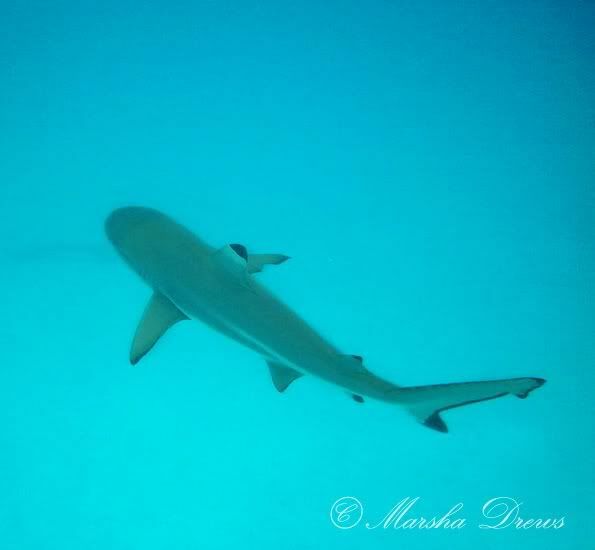 And getting so close to the sharks! I hope our family can go there someday--so cool! I love you! Wow! Great pictures. So much beauty! You're blessed! Absolutely magnificent Marsha. I love that you had this adventure and were able to explore such a beautiful part of God's creation. Beautiful in every way! So amazing! The pictures are just gorgeous. Now the shark part! Eek...no way! But the rest...I'm ready to contact a travel agent! What a gorgeous place. That beautiful water almost took my breath away. It all just looks so serene. Our God is such a wonderful Creator. Sigh . . . Enjoy! Anyways... it was neat to be able to think about you guys having just been there. How spectacular! I sighed and oohed and ahhed over the pictures... what an amazing place to see!